I have always been irritated by Sunday Supplement interviews where the words of the interviewee are buried in the often overly pleased-with-itself prose of the interviewer. If all you really want to do is write about someone, why go to the trouble of talking to them? Clearly the newest winner of the Nobel Prize for Literature, Svetlana Alexievich, agrees; as the first non-fiction author to be honoured, it would be easy to categorise her work as journalism, yet Alexievich seeks to absent herself from the text in a way that even the most honest journalist can only dream of. 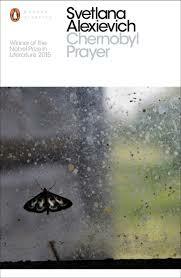 Chernobyl Prayer is a new translation (by Anna Gunin and Arch Tait) of Voices from Chernobyl (Penguin Classics also have a new translation of Zinky Boys coming out later this year). It is typical of Alexievich’s work in that it attacks its topic – typically a topic largely ignored by both mainstream journalism and fiction – using the voices of those who know. Alexievich’s role in this, beyond the initial interviewing (which is extensive), is to arrange those voices in a chorus which captures the totality of the experience: you might compare her to an artist working with found materials. Alexievich describes the evacuated Zone, abandoned houses such as we are used to seeing in apocalyptic Hollywood films. We learn of the genetic damage which continues to affect the population. Told in the voices of those who were, who are, there, we can relate to each individual experience, rather than lose perspective in facts and charts. I am old enough to remember both Chernobyl and the Soviet Union – it would interesting to discover what someone without these memories makes of this book; it must seem like a different world. And that is as good a reason as any for it to be essential reading. You are currently browsing the archives for the Svetlana Alexievich category.